A little handy tool to add to your knitting/ crocheting bag. 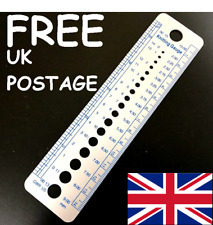 A plastic needles gauge/ sizer. It sizes needles or crochet hooks from 2mm to 10mm. Numbers all clear though! size needles from 2 - 10mm. Whitecroft Essentials Knitting Needle Gauge. Quality Knitting Needle Gauge. Why not add us to yourfavourites list ! Other Information. 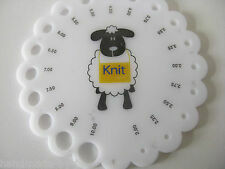 Handmade knitting needle gauge, sheep shaped. It is made of wood and is hand polished for a perfect finish. Perfect accessory for your knitting bag or an excellent gift idea for the knitters you know. Size needles from 2 - 9mm. P & B Beehive needle gauge. Sky blue. Vintage 1950s knitting. Sizes, 1 - 14. The gold blocked numbers are clear, with no rubbing. An interesting and attractive little novelty for display or use. ESSENTIALS KNITTING NEEDLE GAUGE. Ruler on side edge. Plastic needle gauge in case. The gauge is also a handy 5" (12cm) ruler for use while working. Check the size of your needles by placing them into the holes on the gauge. Also a great reference for converting needle sizes from imperial to mm and vice versa. Knitter's gauge. 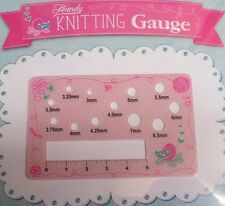 2 x Knitting Gauge. Knitting niddle sizes are given from 2mm to 10mm. Quantity: 2 pcs. Size: 16cm length. High-quality plastic ruler, soft material, prone to break. Also note that monitor settings may vary from computer to computer and may distort actual colors. 2PC x Kintting Gauge. We believe that everything could be solved by communication. Pony Knitting Needle Gauge / Sizer. 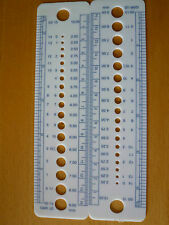 Plastic knitting needle ruler has 19 go-through calibers for US/UK/Canada needle sizes. This sewing ruler is easy to use, making it a must-to-have for your knitting projects. Made of high quality plastic material, so this ruler is durable and flexible.